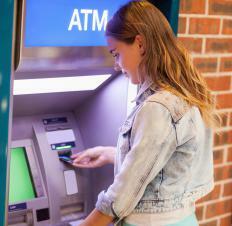 ATMs are one of the most common uses of kiosk software. A kiosk in the realm of information technology is a small structure that includes a display screen and a computer — although the computer may not be seen by the user — often including some kind of set-up that allows user interaction, for example, a keyboard or touch-screen. Kiosks are used on streets, at professional conferences and trade shows, in malls, at grocery stores, and in airports. They have many different purposes. Kiosk software refers to the system software and applications that run a kiosk, and it varies depending on what function the kiosk fulfills. Kiosks may simply provide information, serving as multimedia advertising. They may allow people to conduct financial transactions or provide e-ticketing or check-in services at airports. Different types of kiosks are used for vending, ATM transactions, and for self-checkout at grocery stores. They can be set up for sampling multimedia at stores that sell audio CDs, for example, or provide walk-up photo editing, email access, web browsing, or computer use. They may print a document, burn a CD, or provide change for user transactions. Each of these situations requires a different software solution. Some types of kiosk software, such as what is used for a strictly informational site, may simply run in a loop. While vandalism could be an issue, there is not much concern for privacy or safety issues. With an Internet café or a hospitality kiosk, on the other hand, the need to ensure that private information from one user — such as search history, cookies, form data, passwords, etc., as well as any viruses or malicious content that might have been downloaded and need to be purged — is often addressed by a “cleaning” software. Specially designed kiosk software allows kiosk owners to choose whether to offer services for free, or exact a charge using the user’s credit card. This is sometimes done by choosing different software, or by setting options within the software. Kiosk software can also be used to separate paid services from free services. For example, a hotelier could provide computer access for free but set an option in the software to charge for printing. Kiosk software can also be used to restrict certain computer uses. For example, when computer use is offered, a designated browser can be set, the websites the user can browse can be limited, and the applications the user can access can be limited. Alternatively, the computer can be set to only one application or website, such as webmail. In addition, certain key combinations can be locked down to avoid purposeful or accidental deletion of items or other critical changes from being possible. What is an HR Kiosk? For Mac kiosk, you can use eCrisper.